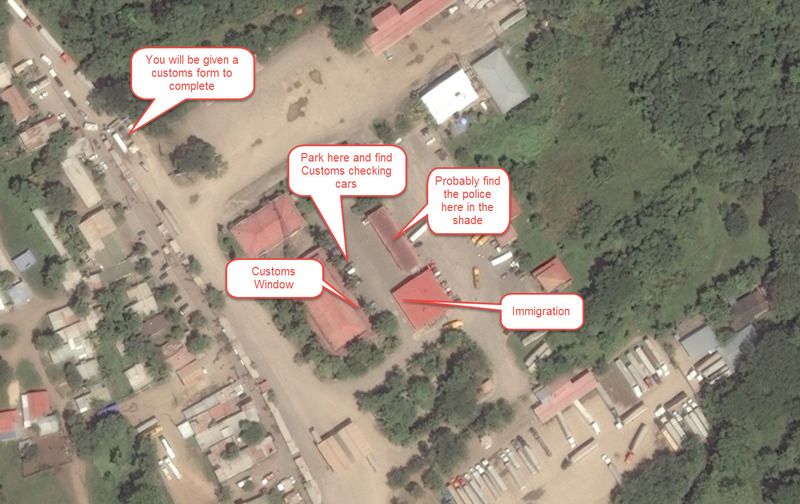 We found the Nicaragua to Costa Rica border crossing quite time consuming. Normally an exit is quick and easy, but when a few coach loads of tourists turn up and it’s lunch time, you can end up waiting and waiting….. The Costa Rica side was quite straight forward especially if you follow the steps below. We were held up at the insurance office as the only person working had “gone to the bank”. Have customs inspect the vehicle; you will find someone in the car park with a clip board checking cars. They will not help you at the customs window until this is complete! Find a policeman hanging around, they are normally near the food stall 11.218503, -85.612673-They will also need to stamp the paper work. You are then free to leave. On exiting the border area, they will take the complete paper work. Immigration – First go to immigration here 11.211921, -85.611302. Temporary Import Permit (TIP) This process is completed in two parts. Part 1: The office is opposite immigration here 11.211942, -85.611448 , you will need the following: Vehicle Registration, Passport and Driving Licence with copies of the same. Complete the forms they give you. Once complete they will stamp and then check your vehicle. Insurance Turn right into an area where you will drive past lots of trucks. Park here 11.210213, -85.612173 and firstly go to the window on the left. Purchase the insurance $36. TIP Part 2 Go to the second customs office here 11.210153, -85.612141 and give them a copy of all the documentation. They will process it and provide you with the TIP. Keep hold of all the documentation you have been given as you need to show this when exiting. Fill up on fuel, food, alcohol in Nicaragua, it’s expensive in Costa Rica! Beware at traffic lights and petrol stations in Nicaragua, people are trying to rob foreigners by cutting their tyre and then pretending to help them with the flat! Like most things in Latin America, everything is subject to change. The Nicaraguan exit is still as described, but no longer in the offices marked on your map. Everything has moved farther along the road and on the right instead of the left. Same process, but very little signage on any office. Costa Rica side was exactly the same as you described and your site was a big help, thank you. 2. Check your lugnuts after ANYTIME you leave your vehicle unattended. One of our tires had all the lugnuts loosened (had to be on purpose) and the only thing that may have literally saved us was the lock on one of the lugnuts. Don’t even want to imagine how it would have ended otherwise. Again, thank you very much for posting your site!